Junior Professor Román Orús of Johannes Gutenberg University Mainz (JGU) has been awarded the EPS Early Career Prize of the European Physical Society (EPS). This new EPS prize is designed to recognize the contributions of young physicists to European research, with two researchers receiving the award each time. The first laureates are Román Orús of the Institute of Physics at Mainz University and Dr. Ian Chapman of the Culham Center for Fusion Energy in the United Kingdom for his work within the European fusion program. Orús received the award for his contribution to the development of European expertise in the field of tensor network techniques for the numerical simulation of quantum matter. Román Orús obtained his PhD from the University of Barcelona and during his postdoctoral research he investigated entanglement, quantum many-body systems, and simulation methods at the University of Queensland in Australia and the Max Planck Institute for Quantum Optics in Garching. 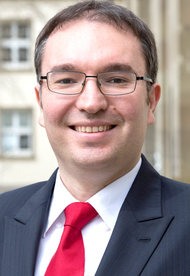 Since April 2013, he has been Junior Professor in Condensed Matter Theory at the Institute of Physics of Johannes Gutenberg University Mainz. Orús has written more than 40 papers on quantum entanglement and tensor networks over the last ten years. From this year on, the European Physical Society intends to award two Early Career Prizes every year in order to honor contributions to the development and reputation of physics in Europe. Founded in 1968, the EPS now represents 42 national physics societies with a membership of more than 130,000 physicists.